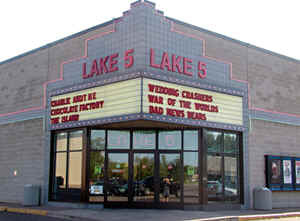 Lake 5 is an independently and locally owned five-screen movie theater that is pleased to serve the Forest Lake and surrounding Minnesota area, along with nearby western Wisconsin. We are conveniently located next to the Northland Plaza on Hwy. 61 (Lake St.) just south of downtown Forest Lake. We offer the latest and most popular first run movie titles, along with a warm, friendly atmosphere and personal service. The Lake 5 offers our customers exceptional service and a clean and friendly atmosphere. All of our auditoriums are equipped with Dolby DTS digital sound and offer comfortable high-backed rocker chairs with armrests and cup holders that can be flipped up allowing for "love-seat" style seating! Lake 5 Inside ViewThe Lake 5 Theatre lobby is designed for easy access for everyone in the family and is also handicapped accessible. Our concession area features a wide variety of movie favorites, including fountain and bottled sodas, bottled waters, Gatorade, mouth watering popcorn that is popped fresh throughout the day, candy, Icees and cheesy nachos. For more information on our concession products and prices click here. In addition to offering the latest and most popular movie titles, Lake 5 Theatre also features several special services including gift certificates, VIP tickets, and group rates. Need an auditorium or want a private screening? We also offer theater rentals for your special function or occasion. Box OfficeThe Lake 5 box office opens daily 20 mins. before the start of the first feature. We offer daily matinees with reduced pricing for everyone as well as nightly showings that are priced much lower than the big theater chains can offer! 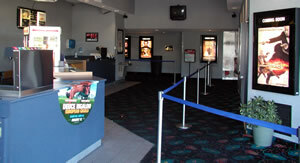 We gladly accept cash, credit cards, and Lake 5 gift certificates for movie purchases and at our concession area. Movies are better than ever at Lake 5!